When parents or relatives call authorities to report missing children, too often they cannot provide an accurate description of their missing child. However, a national study survey found that 34% of parents could not tell the exact weight, height and eye color of their children. All parents need to be able to provide this kind of identifying information to law enforcement in the event of an emergency. The Child Identification Program is a community service initiative dedicated to changing these statistics by providing parents and guardians with a tool they can use to help protect their children. The Childrens I.D. 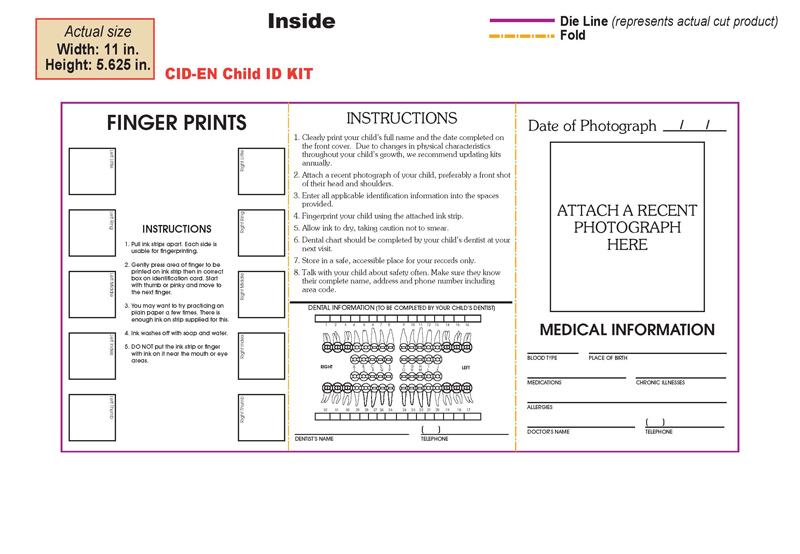 Kit allows parents to collect specific information by easily recording the physical characteristics and fingerprints of their children on identification cards that are then kept at home by the parent or guardian. If ever needed, this I.D. Kit will give authorities vital information to assist their efforts to locate a missing child. 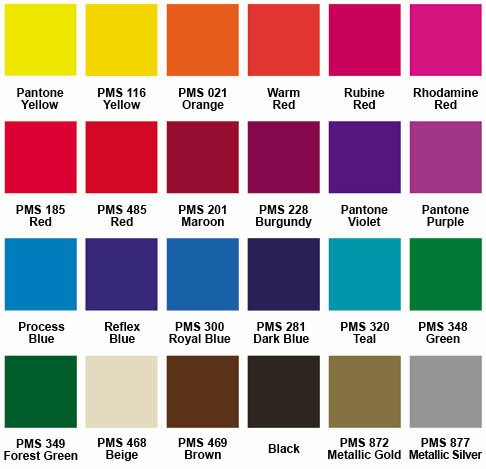 Pricing is per kit, per color. Size: Over All Size: 11" x 5 5/8". Folded Size: 3 3/4" x 5 5/8"
Great For: Banks, Day Cares, Politicians, Schools/Churches, Community Centers, T.V. & Radio Stations, Government Agencies, Park, Districts & Libraries, Police & Fire Departments, Health & Medical Businesses. 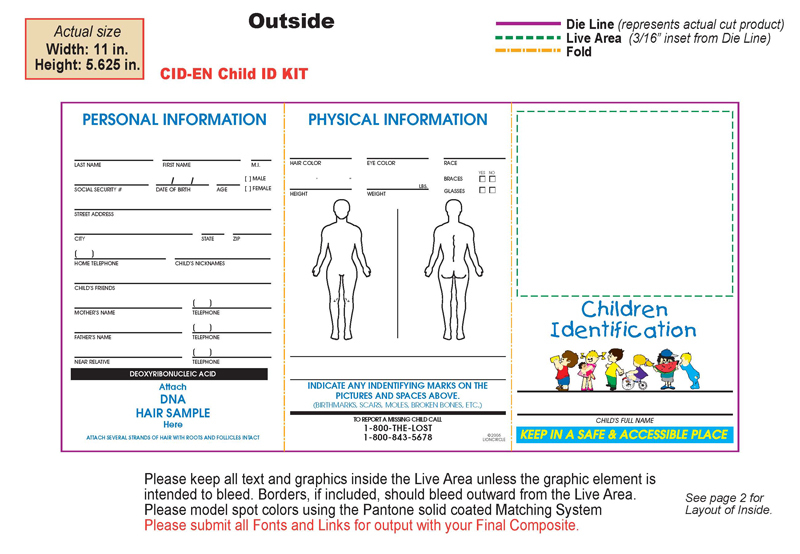 Kit Includes: Pre-Inked Finger Print Strip, Area for photo, Personal Information, Area for DNA Sample, Medical Information, Area for Dental Chart, Physical Information, Individually packed in sleeve, Comes in a Resealable Holder, Includes Ink Strip. Imprint: 3 1/4" x 2 1/2"
Stock: 8 pt. Board Stock.